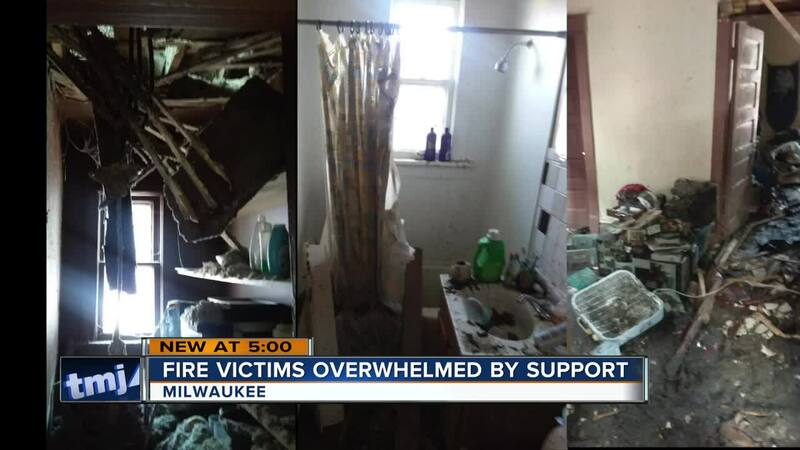 A Riverwest woman is overwhelmed by the support from the community after her home was engulfed in flames. Flames tore through Alberta Dziadulewicz's Riverwest home 10 days ago. Everyone got out safely, but there's a lot of damage. From the outside, you can see every window is now broken or boarded-up. "It's devastating," Dziadulewicz said. "We lived here 20 some years. This was our home. My husband and I are now staying with my nephew until we figure out what we can do." Dziadulewicz, a retired nurse on a fixed income, married her husband, raised her children, and took care of her ailing mother in this home. She's also active in the community, and is known for helping neighbors. "I'm still praying it will be like it was, and we can move back in soon," she said. "But that's not reality. It's hard to see the house like this, it really is. But life goes on." A distant friend, Betsy Rowbottom, heard about the fire and wanted to do something to help, but wasn't sure what. "I thought maybe I can look through some of my stuff and donate things Alberta might need," Rowbottom said. "But then I thought about it more, and I know that people who've lost a lot, really need cash to rebuild. New dry wall, windows and carpet takes money." So, Rowbottom created her first GoFundMe page, with the hope of raising a couple hundred dollars for Dziadulewicz. "I asked for small donations, and it it just kept growing," she said. "It's been amazing to get such supportive messages from strangers. People really do step up." In just a week, people have donated more than $2,100. "I can't thank her, and everyone who donated enough," Dziadulewicz said. "To know they're thinking of me, and willing to do something to help means so much. I especially thank God for the Riverwest area. I don't know what I did to deserve all of this, but I'm so thankful."